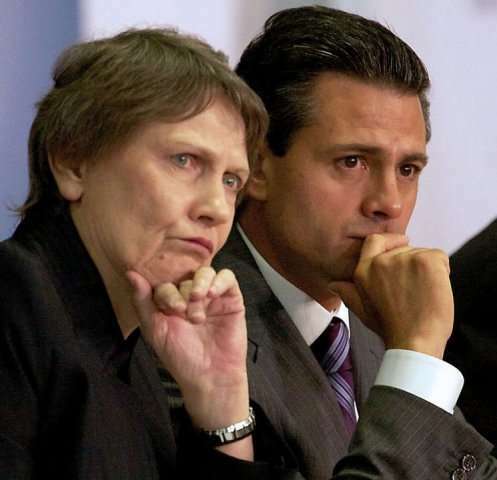 Handout picture released by the Mexican presidency showing Mexican President Enrique Pena Nieto (R) accompanied by the Administrator of the United Nations Development (PNUD), Helen Clark , during the presentation of the 2013 Human Development Report in Mexico City on March 14, 2013. The rise of developing nations has cut poverty while the combined economies of Brazil, China and India are on a path to overtake wealthy nations, but failure to act on climate change could reverse those gains, a UN report said Thursday. Developing nations are now driving economic growth, helping to lift hundreds of millions of people out of poverty and bringing billions more into a new middle class, the United Nations Development Programme (UNDP). The report sees a "dramatic rebalancing of global economic power" and forecasts that the combined economic output of Brazil, China and India will surpass the aggregate production of the United States, Canada, Britain, France, Germany and Italy by 2020. "The rise of the South is unprecedented in its speed and scale," according to the document, titled "The Rise of the South: Human Progress in a Diverse World." "Never in history have the living conditions and prospects of so many people changed so dramatically and so fast," said the report presented in Mexico City. China and India doubled their per capita economic output in less than 20 years, a rate twice as fast as Europe and North America experienced during the Industrial Revolution. The proportion of people living in extreme poverty worldwide fell from 43 percent in 1990 to 22 percent in 2008, with more than 500,000 million people rising above the poverty line in China alone. The share of people living on less than $1.25 per day has been cut in half, meeting one of the main targets of the Millennium Development Goals. But the South faces similar long-term challenges as the leading industrialized nations, from an aging population to environmental pressures and social inequalities. Lack of action against climate change could even halt or reverse human development progress in the world's poorest countries, pushing up to three billion people into extreme poverty by 2050 unless environmental disasters are prevented, the report said. "Never in history have the living conditions and prospects of so many people changed so dramatically and so fast," "The rise of the South is unprecedented in its speed and scale,"
This, without any "action" on climate change. "Lack of action against climate change could even halt or reverse human development progress in the world's poorest countries, pushing up to three billion people into extreme poverty by 2050 unless environmental disasters are prevented, the report said." This is a complete non-sequitur. Pure propaganda. The article does not even attempt to explain the conclusion. It could just as easily be that "action" on climate change will hinder the "unprecedented" progress taking place. In fact, it seems likely. Oh, back to further your case against the science Claudius? Of course, I can see this comment is just a rant of accusation of conspiracy. So the whole posturing thing, was just that then, posturing. Funny isn't it, how easily I predicted the truth of your motive. I see that. as always Maggnus, rather than discuss the issues...you resort to personal attacks. appears as if you are just another Vendi sockpuppet. Ahhhh. The Vendi imposter is back. Do you have anything scientific to add to the discussion? The point of the article is that developing nations are making headway in improving their standard of living. However, climate change will have an undefined impact on their progress. Since developed nations will be facing serious impacts from climate change it will be difficult for the developing nations to mitigate the effects. So, Vindi-imposter, make a meaningful contribution to the debate. There are no issues sock puppet. Just a left-over cadre of the lunatic fringe peeking out from their back-yard bunkers wondering what happened to Nabiriu and the Zeta-Reticulans.